Satirist, comedian and TV host Bill Maher has set the boundaries of where funny, political talk can go on American television for more than twenty years. 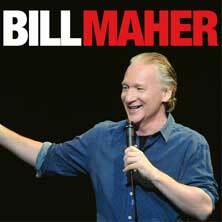 To be the first to hear when more Bill Maher tickets go on sale you can sign up to the Eventim Ticket Alarm below. Maher started his career as a stand-up comedian in 1979, and still performs at least fifty dates a year in Las Vegas and in sold out theatres all across the US. Three of his nine stand-up specials for HBO – 2007’s “The Decider,” 2005’s “I’m Swiss,” and the hilarious, “Bill Maher … But I’m Not Wrong,” – have been nominated for Emmy awards.